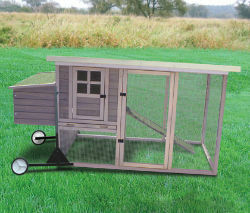 Convert most chicken coops into a mobile home for easy moving and cleaning. Allows chickens to regularly graze on fresh grass and fertilize different areas of the yard. Handles attach in minutes and can be removed easily after the chicken coop is moved to the desired location.